Today I am going to talk about a basic trouble that we usually face while our 8-12 Hrs spent in office – “the Outlook trouble”. The trouble if you ask me can be of any sort it is like you are unable to do something is a trouble. You have to repeat a task to perform a job is a trouble. You take a long leap to perform Technorati Tags: Delay,Mail,Outlooka job while there are shorter alternatives available is a trouble. So today I am going to tell you an Issue that we ignore but it wastes our incredible amount of time. You have to go through older mails multiple times in a day. Boss comes in asking what you did for the Issue raised by him last week, In haste you start looking for your boss mail and your revert mail and in process you accidentally made an important mail sent by him(Your Boss) today. So a new debate with your boss is opening its gate which make you more and more frustrated Isn’t it? Such useless things sometimes make or break relations in your office. Because nowadays unread mail hurts Ego of person at other side of the table. Now this is a situation which practically happens to each one of us working day and night. We either miss it or if we observe it we need to manually Mark Mail as Unread. Let us solve this Issue and after this Post please thank me if I saved your 5 Minutes in a day. Outlook has a setting in the options menu that will allow you to add a delay to how long it takes to mark your messages as read. 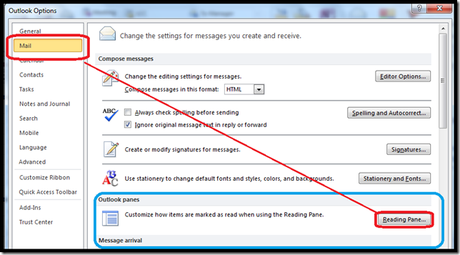 Once you have it set, Outlook will wait for the allotted amount of time before automatically marking the email as read. Read on to learn how to set this up. 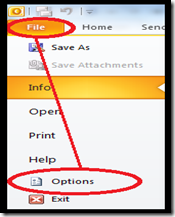 1.In Microsoft Outlook 2010 Click the File tab, and then from the menu Click Options. Pane, then Enter the Number of Seconds you would like Outlook 2010 to wait before marking your email as read. Keep in mind this number will be applied to all emails opened from now on regardless of their size, so aim for the average time it takes you to read your emails. Now whenever you read an email, Outlook will wait for you to have that email open for allotted amount of time before marking it as read. Please share with me and other readers how much time in a Day this trick helped you save. Year 2012:::From the Eyes of Tele-Columnist! How to Save Yourself of Copyright Violation! !